As an introduction to video technology, compression, and delivery standards for optimizing content delivery to mobile and desktop devices, this session will provide an overview with key techniques and tips that you need to know about editing, preparing and delivering the highest quality video and audio to your audience. We'll also discuss interactivity that can be added, the latest industry standards, and how you can take advantage of open source, free compression tools, and the latest applications for getting the smallest file sizes and the highest quality. We'll also take a look at the hardware and software needed to create your own in-house studio for under $1,500. 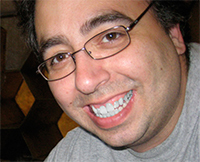 Nick Floro is the president of Sealworks Interactive Studios. Nick has over 20 years of experience developing e-Learning solutions, applications and web platforms. He has worked with numerous Fortune 500 companies to help them understand the technology and develop innovative solutions to help their teams and customer base. In 2011, Nick’s team designed and launched a new web application, Launchcycle.com, to help developers and designers simplify project collaboration and the management of tasks, assets and projects. Nick has won several industry awards including from Apple and Fortune 500 organizations for course, app and development services. Nick is passionate about how design and technology can enhance learning and loves to share his knowledge and experience to teach, inspire and motivate participants.